Eugene Onegin (1879), Tchaikovsky’s most popular opera, makes a welcome return to the Canadian Opera Company after an absence of 13 years in an unusual but intriguing production from Opéra national du Rhin. Canadian baritone Brett Polegato and Northern Irish soprano Giselle Allen are riveting as the opera’s unhappy lovers. Based on Alexander Pushkin’s innovative verse novel of the same title (1832), the opera follows the haughty, self-centered Onegin (Polegato), who unintentionally ruins the lives of all those around him. When the idealistic young Tatyana (Allen) falls in love with him and pours out her heart to him in a letter, he lectures her in a gentle but patronizing manner about their unsuitability. To amuse himself at party for Tatyana and to rile his best friend Lensky (Daniil Shtoda), Onegin flirts with Lensky’s fiancée Olga (Allyson McHardy), causing the drunken Lensky to challenge him to a duel. 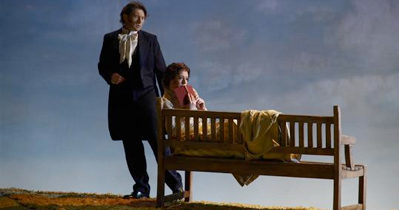 The production directed by Enrico De Feo, begins at the end of the story and has the now devastated Onegin looking back as in a dream over the past events. The impressive set represented a huge white room open at the back and tilting at about a 20-degree angle. We thus are revisiting the action through a mind that has gone awry. This directorial concept requires Polegato to be on stage as singer or observer for virtually the entire 2 1/2-hour running time. A less consummate actor than Polegato would not be able to make this concept work. As it is, it is fascinating to see the clear contrast Polegato makes between the the Onegin of the present and his conceited former self. His beautiful, rich voice is a constant pleasure. Allen, for her part is wonderful at showing Tatyana’s growth from a shy, naïve country girl to the mature wife of the elderly Prince Gremin (Alexander Kisselev). She captures all the awkward feelings of love and fear in Tatiana’s famous Letter Aria in Act 1. McHardy with lovely low tones embodies all of Olga’s outgoing the love of life. The impression Shtoda made was literally muted by conductor Sir Richard Armstrong’s encouragement of the COC Orchestra to play too loudly. Only when Armstrong had toned down the orchestra in Act 2, could we hear how fine a voice Shtoda has. Aside from initial over-loudness, the orchestra plays the score with all the fire and verve of a Tchaikovsky symphony. It rises to a climax in the heart-rending final encounter between Onegin and Tatyana that speaks to anyone who has had that bitter thought, “If only ...”. Note: A version of this review appeared in Eye Weekly 2008-01-14. Photo: Brett Polegato and Giselle allen. ©Michael Cooper.